Snow. What tyres to make it safe ? We had four cm of snow last night, the first real snow of the winter. It looks wonderful, but snow can be dangerous for cyclists especially if it is not removed from the cycle-paths and if it becomes compacted. Assen is quite good at clearing snow, but there can still be small patches of ice hidden underneath, especially later in winter. That's why the first thing I did this morning, before breakfast, was change the front tyre of Judy's bike for a Marathon Winter studded tyre. Fitting a studded tyre on the front wheel is the best insurance possible against a fall. Why only the front ? If the front wheel loses traction then a fall is almost inevitable and it is difficult to do anything to control such a fall. Falls due to the rear wheel slipping are much less common and much less scary. clear, but you can't see that from my POV. You can see from the photo at the top that many other people had already cycled this way. People tend not to make so many trips for pleasure, but cycling for utility purposes doesn't reduce much in the winter in the Netherlands. I'll cycle with parcels containing customers' orders from our bike parts shop to the post office a bit later today and mine will not be the only bike there. We still have studded tyres in stock. Order them now and they'll be with you in a few days. Plenty of bikes parked outside the popular Hema department store in a pedestrian zone, and all ages of people arriving and leaving by bike. Plenty of bikes at an indoor shopping centre. Not many people use bakfietsen in Assen because conditions are safe for children to ride their own bikes. However, some people do transport smaller children by bakfiets. A small "traffic jam" on the cycle-path. Utility cycling holds up in the winter because due to the lack of ice on the cycle-paths it is nearly as easy and as subjectively safe to cycle today as it is in the summer. Tread on a bicycle tyre normally serves no purpose other than for marketing. Asphalt or concrete surfaces are harder than rubber, and grip comes from the small imperfections in those surfaces forcing themselves into the rubber. However, when there is snow the tread forces itself into the snow and that is where grip comes from. That is why any treaded tyre is better for snow. However, when it is icy tread doesn't work because ice is too hard to be deformed by rubber. 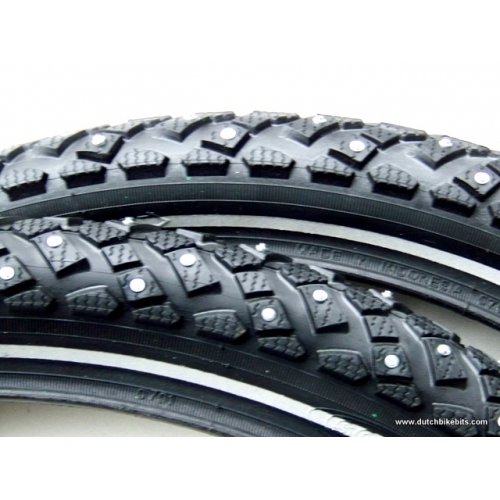 At this point, the studs on the Marathon Winter tyres come into their own. They provide very small points of contact and pierce the ice. By doing so, you have far more grip than is possible with a rubber tyre. You can see both the tread marks in the snow and the black spots where the studs in my tyre pierced the ice underneath the snow, in the photo on the right. For two wheeled bicycles, the most critical tyre is the front tyre. However, with a velomobile or other three wheel recumbent with two wheels at the front the situation is reversed. With that type of bike it is absolutely critical that the rear wheel does not lose traction as that can result in the bike rotating to travel sideways and turning over. That's why I fit just one Marathon Winter tyre to the rear wheel of my Mango making it possible to continue going for recreational rides in the winter in safety.